If you love to cook, and frequently use large pots and pans, then you know how tiny that typical kitchen sink can feel. It can be frustrating, trying to get at the faucet with all those dishes and pans in there. But now that you can get farmhouse kitchen sinks, that are being created to work in most remodels, then this is one item you should allow for in your remodeling budget. So, maybe you are saying to yourself “yes but I like a modern, sleek and stainless steel design, a farmhouse look will not work”. Then take a look at the latest in designs, by heading to a kitchen showroom. This is like eye candy to anyone who spends a lot of time in their kitchen. There are so many accessories you can get, that your budget can soon be overwhelmed. Yes, they have reworked the older style farm look into a modern, sleek stainless steel sink with the farmhouse look that will work just beautifully into a modern design. But many people overlook the sink. They simply decide whether they want a typical double or single bowl one, and then spend the rest of their time working on the cabinets, hardware and other accessories, when in fact, it can be one of the most prominent parts of your design. If you like modern styling with sleek lines, then you will like these. 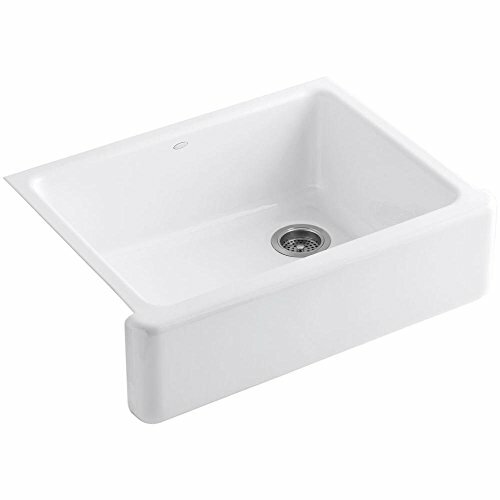 The beauty of these styles of sinks, is that they are manufactured for almost all kitchen designs. Instead of trying to hide it, it can now been shown off, just like the rest of the space. You can get them in copper for that older world styling, best in warm tones such as the darker cabinets and for that rustic styling. Or you can get white porcelain for that clean white look, especially if you have white appliances, this looks good. But the best part about this design, is they don’t have to hide into the background of your kitchen design. You can take these and make them the centerpiece. Not only are they beautiful, but they are so functional, that you will not go back to the typical one again. If you love to cook, and frequently entertain, then putting that large pot in the sink, is no problem with this style. These styles, are much deeper than the typical sink and because they have a apron on the front (it is not hidden into the countertop, the front of the sink is exposed and this is called the apron) it allows for more room front to back in this style. A typical sink is fitted into the countertop with counter space at the front and behind the sink, and much shallower. Not the most functional for anyone that uses their kitchen a lot. So, if you are about to embark on a remodel, but maybe you have beautiful stainless steel appliances that you do not want to part with, then consider getting a stainless steel farmhouse kitchen sink. They are easy to take care of, and look amazing as the centerpiece of your space. Also see Farmhouse Kitchen Tables for more great ideas. This is when function meets beauty! This is a beautiful white one.